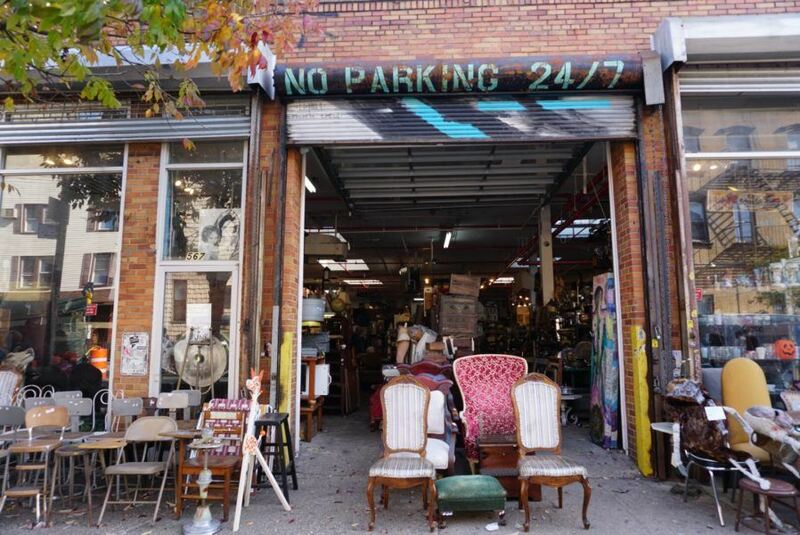 Mother of Junk may not be Brooklyn’s best curated thrift shop or even the best priced. 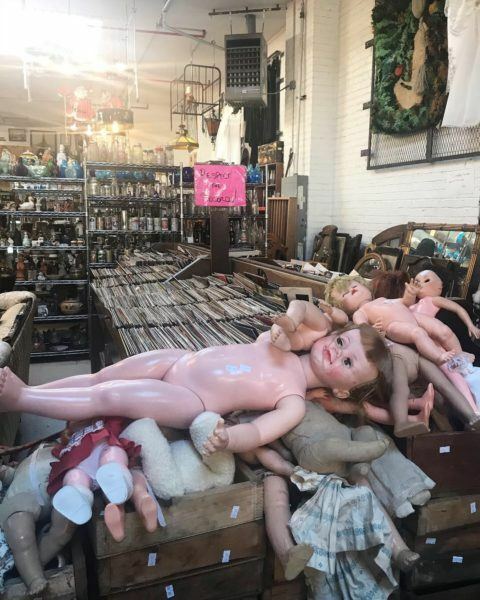 But if you’re looking for a fun, jumbled thrift shop to sift through, with plenty of offbeat items and WTF moments, then Mother Junk is for you. In warm weather the garage door is wide open, with an assortment of chairs lining the storefront at Mother Junk. Besides the novelty factor, Mother of Junk has lots of things going for it. First, there is the location. It’s a block away from the L train Bedford stop, in the heart of Williamsburg. The sign in not prevalent (I had to google it to figure out the name) but you can’t miss the storefront at 567 Driggs Avenue (I read there is another location on Union Avenue, but have not been). I first discovered this shop when I arrived early to meet a friend and needed to kill some time– I wandered a bit, saw the shop, lost track of time and ended up being late! Next is the actual space. 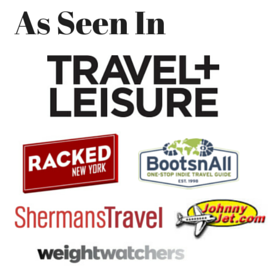 Most thrift stores, especially New York City ones, are small, cluttered and claustrophobic. While Mother Junk might be cluttered, it’s not overly so. And the clutter is made up for by the large open space. Even in the winter, the high ceilings and streaming light make shopping a pleasant experience. I read the reviews of Mother of Junk on Yelp that complained about the “horrible” owner. I laughed to myself and thought these whiney Yelpers were pretty thin-skinned and perhaps hadn’t been to many of these old school type thrift shops. Older thrift store owners can be notoriously crotchety. Then I had my own encounter with the owner. I was strongly scolded for discreetly taking photos, and my explanation that I was taking them to help promote the shop–for free– fell on deaf ears. The experience was amusing and in no way intimidating and I don’t think anyone should be put off from visiting because of a cranky owner, just don’t take it personally! 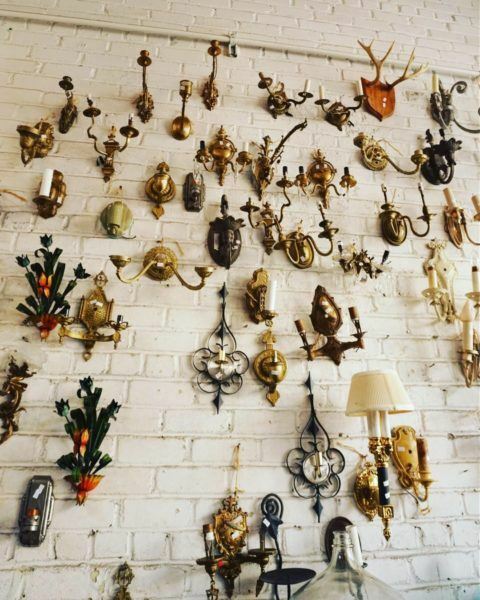 Vintage sconces of every variety. 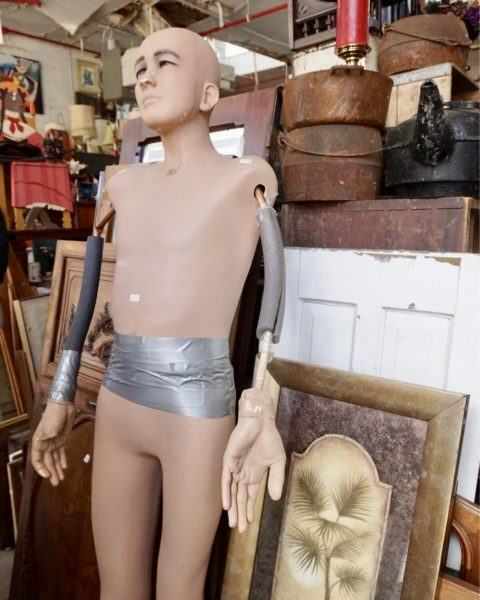 If you need a broken mannequins held together with duct tape, this Brooklyn vintage shop is your spot. Shop for mannequin legs in bulk. 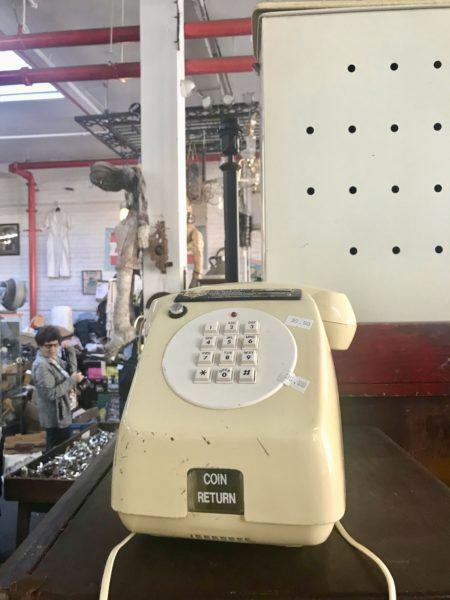 A touch tone phone, coin operated. Some unique art for your walls at Mother of Junk. Plenty of art to sift through. 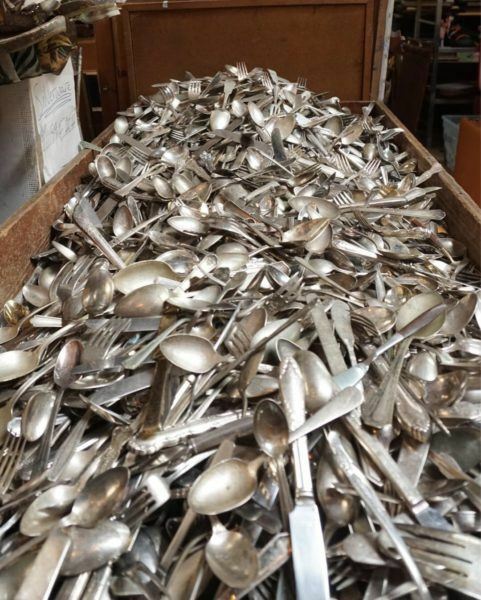 A pile of mismatched silverware. Vintage doll waiting to be loved. This stained glass piece hanging in the window was intriguing. I sometimes buy art for the frame and replace the orginal. Inside the vintage shop Mother of Junk. Small items like this pup mug. Chairs seem to be a specialty here. Have you been to Mother of Junk? 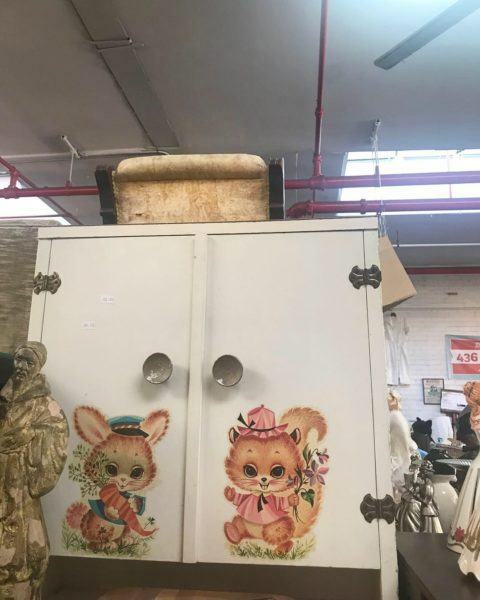 What’s your favorite New York City vintage shop?